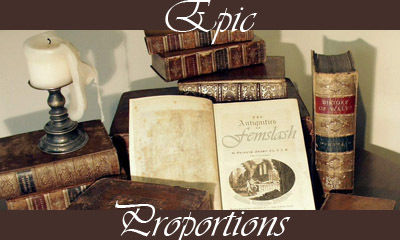 The second Epic Proportions challenge opened on the 1st January 2008 with a closing date of 5th April the same year. The aim of the challenge was to prompt longer stories and, we dared to hope, epics from the femslash world. All fandoms adhering to the site's rules and regulations were welcome, as were original tales, so long as they followed the usual guidelines and were a minimum of 20,000 words. The response to the challenge was once again enough to warm the heart of any archivist and femslash lover and a big 'Thank You' goes out to everyone who participated. Now, go enjoy the stories. Emily/JJ - While solving a case, Emily & JJ are forced to take a closer look at their relationship. First time. Emily/JJ - A look at three pivotal moments in the relationship between the two women � two shorter moments leading to the ultimate defining one, the moment of truth. Andy/Miranda - Andy is gone but not forgotten. Andy/Miranda - and Miranda reconnect, and fake bribes are exchanged. Things progress. In Book One, Suzie Hofmeyer, recently bereaved, had reached a life changing point. With the opening of a much dreamt about Coffee Shop, she could hopefully put some of her past behind her. During the hectic first year of the coffee shop�s development, a widowed police officer, Christine Walker, and her young daughter arrived on the scene. In Book Two, we pick up the story halfway through December after the two ladies have finally made a face to face connection. Are their dreams about to be realised? Lindsay/Cindy - Takes place directly after the episode 'FBI Guy'. While Lindsay has studied the Kiss-Me-Not killer, he has studied her in return. Lindsay is getting closer to her own personal demon, trying to figure out her feelings for Cindy at the same time. The killer, armed with more than the knowledge of what would hurt her most, is waiting to make his final move. Xena/Gabrielle Annie/Mattie Mel/Janice - Xena and Gabrielle's story has spanned continents and millennia; but now, as the threads of their various modern incarnations intertwine for one final adventure, their love could meet the greatest test of all. In this early tale from the Amazon Nation, Solari, Ephiny and a handful of young recruits are paired up for a wilderness survival test. The intrepid Amazons soon learn the wilderness is a dangerous place and what can go wrong, will go wrong.